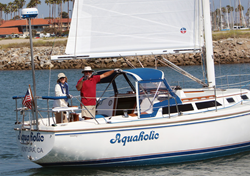 BoatUS has helpful resources for finding the perfect boat name and designing the graphic. Have fun and get help from BoatUS if needed. So what does the boat’s name tell you about this owner? A boat name can reveal much about the personality of a boat owner. Are they into fishing? Reel Therapy on the boat’s transom certainly shows it. Do they have kids in school? What College Fund? says it best. Like to sing? In Harmony is a popular choice. Work in the finance industry? Liquid Assets is suitable. For a look at all of the boat names, go to BoatUS.com/boatnames. The BoatUS Graphics service offers an online design tool to easily create custom boat graphics with fast turnaround times. All graphics come with a 30-day “Oops Assurance Guarantee” that allow a buyer to receive replacement decals free of charge if the graphic was damaged during installation. For more, go to BoatUS.com/boatnames.